Born in San Francisco, California on February 20, 1902. His parents were upper-class and his father owned a lumber business that was created by his grandfather. During the aftershocks of the April 18, 1906 earthquake, he was tossed into a wall and broke his nose. He was four years old. He was frequently sick and diagnosed with hypochondria. He fell in love with nature at a young age. He and his family were close to Lobos Creek, Baker Beach, and Lands End. His father’s business dropped after the grandfather’s death and the Panic of 1907. Their lifestyle changed drastically. Adams was kicked out of several private schools due to his restlessness and inability to pay attention. By the time he was 12, his father pulled him out of school and started to privately tutor him with his Aunt Mary. His aunt was a disciple of a women’s suffrage advocate and so he was greatly influenced by her teaching him the ways of the advocate (Robert G. Ingersoll). After a few years of private tutoring, Adams was able to return to private school and graduate from eighth grade on June 8, 1917. He was very close to his father, but his mother didn’t support his love of photography. He taught himself piano at 12 and pursued music as his first occupation. He was taught by Henry Cowell (a composer). Music gave him discipline, substance, and structure and influenced his visual artistry. First visited Yosemite National Park in 1916 where his father gave him his first camera (a Kodak Brownie box camera). He came back a year later with a tripod and better cameras. He worked part-time at a San Francisco photo finisher and learned basic darkroom techniques. To hone in on his photography skills, he read photography magazines, went to camera club meetings, and attended photography and art exhibits. 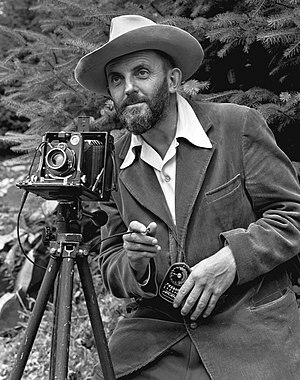 Under the wing of Francis Holman, he went to the High Sierra, developing the stamina required for photographers to take pictures at varied altitudes and in varied weather conditions. He got acquainted with the Best family of Best’s Studio and married Virginia Best in 1928. They took up the studio after the death of Virginia’s father and now Best’s Studio is called the Ansel Adam Gallery. Friends came from musical connections, like his best friend Cedric Wright. He was promoted by Albert Bender (arts-connected businessman) and Adams’ first portfolio gave him much success. He joined the Roxburghe Club (invited by Bender) and learned about printing techniques, inks, design and layout. After his marriage with Virginia, he gave up his occupation as a pianist and she gave up her occupation as a classical singer. He met some elite artists that became his friends named Georgia O’Keeffe, John Marin, and famous photographer Paul Strand. Strand influenced Adams greatly, showing him his techniques and giving him helpful suggestions. Adams was talkative and high-spirited, which made him popular in his group of friends. With the help of his friend Francis P. Farquhar, Adams placed his first solo museum exhibition in Smithsonian Institution in 1931. Adams’ friend Alfred Stieglitz was another great influence for him and allowed him to showcase his photographs in his gallery. He gave workshops in Detroit and started teaching in 1941 at the Art Center School of Los Angeles. In Sept. of 1941 he contracted with the Department of Interior, making photographs of National Parks, Indian reservations, etc. He used his photography to help the war effort after the attack on Pearl Harbor. He helped the military find prints of secret Japanese installations in the Aleutians. He also supported Japanese-Americans and made picture books and photo-essays. In 1945, Adams was asked to form the first fine art photography department at the San Francisco Art Institute. He invited Imogen Cunningham, Edward Weston, and Dorothea Lange to be guest lecturers and Minor White to be the lead instructor. In 1952, he was one of the founders of the magazine called Aperture. Contributed to the Arizona Highways as well. One of his articles was published with the help of his friend Nancy Newhall. He was elected in 1966 a member of the American Academy of Arts and Sciences. President Jimmy Carter awarded him with the Presidential Medal of Freedom, highest civilian honor. In 1919, he joined the Sierra Club and served as director of the club (Virginia did, too). He served on the board of directors for 37 years. He was the guest of honor at the Rencontres d'Arles festival (France) in 1974. President Jimmy Carter commissioned Adams to make a photograph of him. The first time that had ever been done. His famous photograph called Moonrise gave him over $25,000,000 as a total value. With Imogen Cunningham and Edward Weston, Adams created Group f/64. Became a consultant for Polaroid Corporation, found by his friend Edwin Land. Adams and a friend named Fred Archer created the Zone System, a technique that gives photographers better control over their finished photographs. Using photography, Adams helped preserve the designation of the Sequoia and Kings Canyon. Doctor of Arts from Yale and Harvard universities. Awarded the Conservation Service Award by the Department of the Interior in 1968. Sierra Club John Muir Award in 1963. Inducted in to the California Hall of Fame, by California Governor Arnold Schwarzenegger and First Lady Maria Shriver in 2007. The Minarets Wilderness in the Inyo National Forest and a 11,760-foot (3,580 m) peak therein were renamed the Ansel Adams Wilderness and Mount Ansel Adams respectively in 1985. The Sierra Club's Ansel Adams Award for Conservation Photography was established in 1971. The Ansel Adams Award for Conservation was established in 1980 by The Wilderness Society.